(#180) Access and Power of Technology: Carpe Diem! are you using this power? ?4U (I have a question for you): Do we understand what we have at our fingertips? 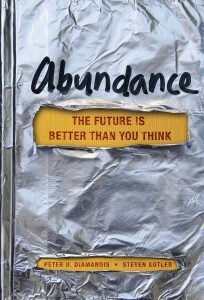 In their book Abundance: The Future is Better Than You Think, Peter Diamandis and Steven Kotler grabbed my attention in the first few pages with two considerations. While many of my students belong to the Net-Gen (they have not known a world without the Internet) and are “connected” that does not make them tech savvy. More to the point, they are tech-dependent. Always having to be in touch, they live in constant FOMO (fear of missing out). My students told me they mostly use their smart phones (about 50% of my students have them) for texting and social media updates. So, all that power they have access to is used for “What’s up?” and “I’m having a taco for lunch.” Missed opportunities. Consider the potential in this abundance. Again, whoa! 5,000,000,000,000,000,000! Is that becoming 2M2H (too much to handle)? Is it 511 (more information than 411)? Think of your last Google search. How many “hits” turned up? Thousands? Millions? A billion plus? Which links did you click on? My students tell me that they tend to look at the first one or two items on the page. Right now about 1 in every 5 people in the world has a smartphone. Global mobile phone traffic is expected to reach 134 exabytes in 2017. What are you doing with the power of the Internet and new technologies? How do you use it to better your life and improve the quality of life around you? At the end of the day, have you seized the day and accessed the power that waits? We need to move beyond BYOD (bring your own device). IMHO (in my humble opinion), we must learn how and when to harness the power and add value to the conversation. 3 Responses to (#180) Access and Power of Technology: Carpe Diem!